Leaving one's home for a retirement community is a highly emotional, often difficult , decision facing seniors everywhere. 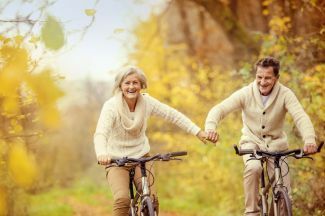 While its tough to leave the comfortable confines of a home you've grown to love there are a multitude of excellent retirement communities out there, each with its own unique personality and features. The key lies in finding the community that is just right for you. Deciding which community is just right is a challenge. However, its a challenge that can be solved by simply doing your homework. The most important distinction to make is simply what type of retirement community you are seeking out. Some communities tout themselves as independent living communities while others offer assisted living or even full scale nursing care. No matter which type of community you choose ensure that it is completely equipped to handle all of your personal needs. Before making any final decision on a community there are several things one must keep in mind. First of all, retirement communities are often expensive. If you are seeking an apartment or single family home located within a community be prepared to pay considerable entry fees that typically run anywhere from $15,000 to $250,000 depending on the dwelling's size and locale. On top of entrance fees its also important to consider whether you will be able to afford ongoing monthly fees associated with your new home. Many communities like to ensure that your monthly income is at least twice the amount of these fees. Secondly, make sure you have a grasp on the structure of and how much included services will costs. In the case of assisted living and nursing facilities, some provide a flat monthly rate for care services while others will charge a base rate and extra if you require additional assistance above a pre-defined level. Furthermore, some facilities have whats known as a fee for service structure. In this scenario there will be no set monthly rate with expenses depending completely on the type of care you require. It is also important that one should do their best to apply to retirement communities while they are still in good health. Waiting for a medical condition to arise before considering a retirement community could cause one's entrance application to be rejected. To feel totally comfortable with your new community, its important to do extensive research prior to even visiting the community for the first time. Once you've done a sufficient amount of background research on your own, its important to not only visit the community but to pay close attention to details. A great number of communities encourage potential residents to come spend the night and even have their meals in the community's dining facility. It is also a good idea to simply strike up a conversation or two with existing residents. Chances are much greater that these conversations will shed more light than conversing with a staff member or going on a traditional tour. If your touring a community which provides assisted living and/or nursing facilities pay close attention to these areas. Make sure to notice if these areas are clean, well maintained, and staffed with friendly individuals. Its also important that specialized areas feel like a part of the community itself, not some isolated branch. Before committing to a community the most important step is to review your contract thoroughly and ask any questions you might have. This contract should completely explain what you are paying for, including information about your living quarters as well as how many meals are included in your monthly fees. Your contract may include housekeeping, laundry, and transportation at no additional cost to you. However, these extras may be provided at an extra charge on an as needed basis. Make sure to iron out these facts, express concerns, and ask any questions before signing on the dotted line. Before considering any retirement community its important to confirm whether or not it is an accredited continuing care retirement community. To see if the community your looking at made the list, simply consult the Continuing Care Accreditation Commission's (CCAC) website. It also important to note that medical care will not always be provided in the same fashion. Some communities will not have nursing or assisted living facilities on site. Some might be affiliated with local hospitals where as some might be completely independent from them. Earlier mention was made of community entry fees. Sometimes one might move into a retirement facility and come to find that its just not the right fit. Before making the decision to commit to a community make sure to ask if the entry fees are either somewhat or totally refundable. Before sinking a lot of money into an important life decision such as this, its a crucial fact to clarify. Unfortunately, health conditions and unforeseen circumstances can significantly alter one's financial position. As scary as it might be to think about, its important to consider the possibility of what might happen should you unexpectedly run out of money. Communities that are non-profit in nature may be willing to continue to care for you, while others might throw you out without a second thought. Asking these tough questions before hand will greatly decrease the chances of any surprises later on. Making the move to a retirement community is a significant event in one's life as well the lives of their family members. This is a decision that should be treated with the up most care and careful planning. Please use the aforementioned suggestions as a starting point in your search process. Never feel afraid to ask too many questions because any respectable community will want to make sure that you are entering into a living arrangement that is as ideal as possible for both parties.